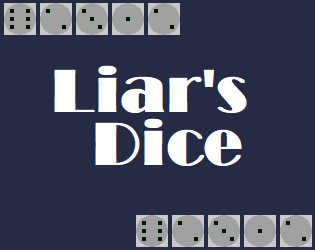 This is the current live build of my Liar's Dice project. Your objective is to bet on how many of (n) of dice (d) you think are currently on the board. The only information you are given is the dice you have in your hand and the number of total dice. Important caveat! Ones are wildcards. This means they represent all possible face values simultaneously. At the start of the game, each player rolls 5 dice and does not reveal the resulting rolls to the others. For the first round, the player who goes first is assigned randomly. Raise: (Sometimes referred to as "betting") You can assert a new face/ value pair. So long as n is higher than the previous bet OR n is equal to the original bet but d is greater than the original. Call: You assert that the current bet is too high. This will end the round and reveal everyone's dice. When someone calls, the round ends and all dice are revealed. The final raise is compared to the total number of dice d on the board (plus all the ones!). If the count (n) is equal to or greater than what was asserted in the raise, the raiser wins. Otherwise, the caller wins. Winner goes first next round, and loser loses a di. When a di is lost, it is eliminated from play, giving that player that much less information to work with in subsequent rounds. When a player runs out of dice, they are out of the game, the last player remaining wins.